A traditional Dutch oven is a heavy pot, usually made of cast iron, that has three legs so that it can cook food over hot coals. 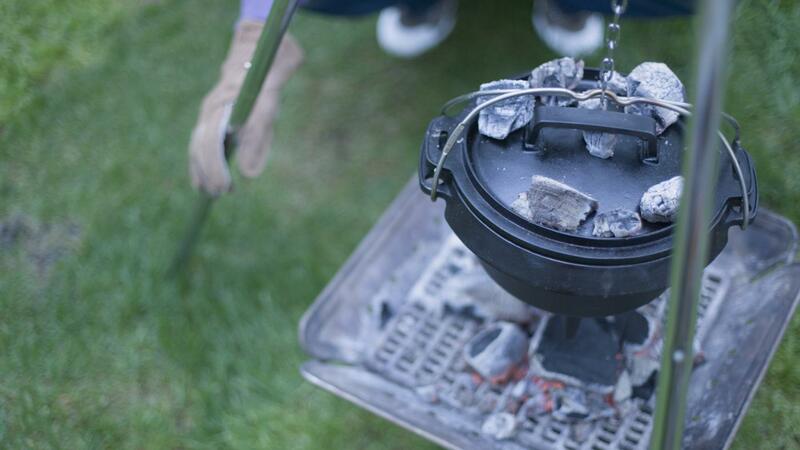 Its close-fitting, flat, brimmed lid allows the cook to pile hot coals on top, helping the food to cook evenly. A cast-iron Dutch oven conducts heat well, which also contributes to even cooking, and it seals in moisture. Over time, a Dutch oven develops a patina known as seasoning that keeps food from sticking to the bottom. A modern Dutch oven is simply a heavy pot with a flat bottom and a close-fitting, heavy lid. An enamel coating brightens the pot's appearance and removes the need to develop a patina. Home cooks usually use this type of oven on a stove instead of over a fire. What Are Some Good Recipes for Cooking in a Dutch Oven? Why Doesn't My Oven Heat Up? Does a Side-Opening Wall Oven Make It Easier to Cook? Can Vintage Wood Stoves Be Used in Modern Homes?